A new report claims that each Instagram post of Cristiano Ronaldo, Selena Gomez, Kim Kardashian and Kylie Jenner, earns them over £300,000. 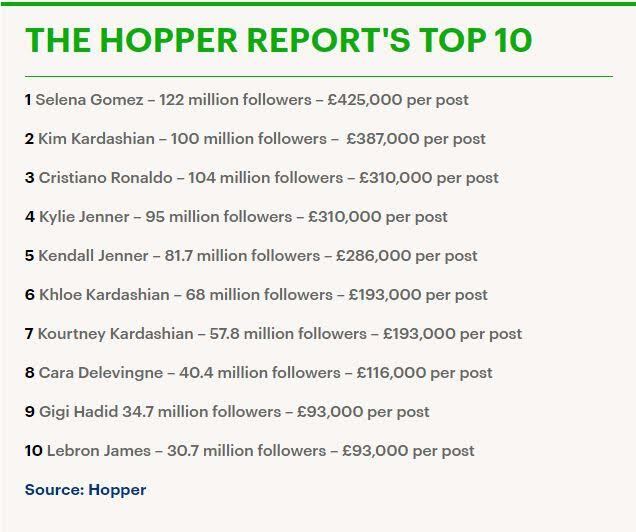 The research which was carried out by Instagram schedulers, Hopper, puts the Real Madrid’s striker third in their top-10 earners’ list, behind only singer Selena Gomez and Kim Kardashian. In the case of the Portuguese striker, who has a large following of 106million on the social network, he’s being paid £310k per post because he’s a prolific contributor who regularly adds multiple images each day of his excursions around the world. According to the Instagram schedulers, Singer Selena Gomez who boast of 122million followers is top of the list with earnings of £425,00 per post. While Kim Kardashian who’s placed in the second position with 100 million followers earns £387, 000 per post.